Slice the snake gourd into rings by removing the centre portion. You may fry the rounds of snake gourd without removing the centre portion. Mix the rice flour, Bengal gram flour, red chilly powder, Kashmiri chilly powder, cooking soda, salt, asafoetida, ajwain seeds with water. Batter should be a thick paste. Dip the snake gourd slices in the batter and drop one by one carefully into the heated cooking oil in a wok.Allow to fry until the bubbles cease. Flip other side of the rings and rounds. Take out and transfer the fritters in a serving bowl. 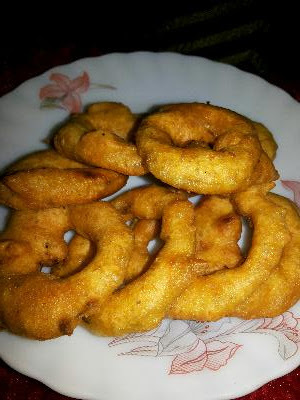 Fried golden brown rings and rounds are ready to serve as an evening snack.